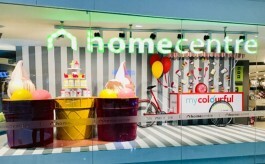 LP’s latest windows to promote their casual wear and wedding collections use two different themes. The former creates a setting of a construction site, while the latter uses the richness of burgundy colour for the regal feel. 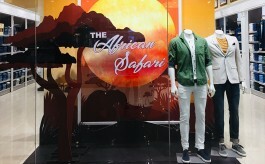 Menswear brands from ABFRL, Louis Philippe (LP), has recently executed two windows, to promote their casual wear and wedding collection. Construct Your Wardrobe is designed to promote LP’s Sports Collection; it’s a representation of a wardrobe where you can wear different colours. A trend in fashion, the wardrobe, designed for casual feel and other activities, presents scaffolding structure replicating a setting of construction. The construction houses boxes with the prints/motifs and colours that are actually used in merchandise. To promote their Luxury Wedding Collection, Louis Philippe uses burgundy as their theme since the colour embodies the perfect balance of tradition and modern wedding elegance. Talking more about the window, Kapil Yadav, Head – VM, LP, explained, “The window display is designed to bring out the Luxury Wedding in the House of Louis Philippe. It’s how a traditional wedding would look like. The horse in the Window is a derivative to give a feel of the Wedding. The elements of inspiration such as floral prints on the backdrop, the colour and jail structure etc add to the elegance and luxury. Further to the window, the mannequin styling is done keeping in mind the sophisticated Louis Philippe man.” Material like FRP Horse, jali pattern on lazer ply, marble floor vinyl have been used to execute the window.